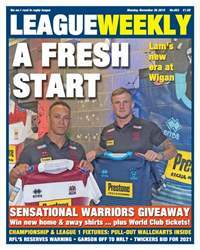 There's A FRESH START at Wigan under Adrian Lam ... we speak to the new interim Warriors coach plus club boss Kris Radlinski about the Super League champions' chances of going back-to-back for the first time in the summer era. 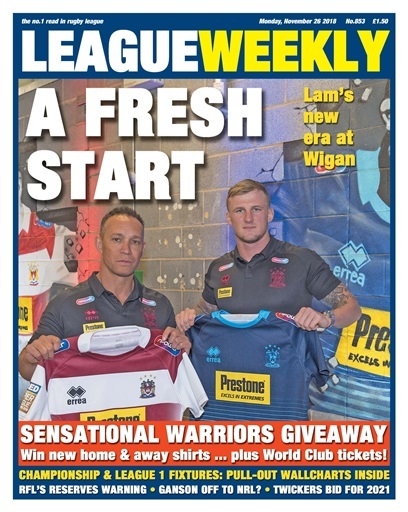 Plus there's an unmissable competition for Warriors fans ... we've got both new 2019 shirts to giveaway, and two tickets to the World Club Challenge! It's fixtures day for Championship and League 1 clubs - keep tabs on your team's schedule with our two pull-out fixture wallcharts. Includes the Summer Bash venue and schedule - and more details on the new 1895 Cup. There's the latest on the reserves farce, with Hull and Wakefield speaking out as they plough ahead with their plans. There's also a message to objectors from the Rugby Football League. Dave 'Nosey' Parker brings the latest gossip - including the possible departure of RFL refs boss Steve Ganson. Mascord Meets Toronto's Martin Vickers as the Wolfpack plan to take games as far as Newcastle and Belgrade! Andrew Voss delivers his verdict on golden point from an NRL perspective.